You can click on all the images in this blogpost to go explore each view further on the interactive map. The ORR publishes station entry/exit numbers on an annual basis, on a “best guess” basis, using ticket sales, gate information and modelling. 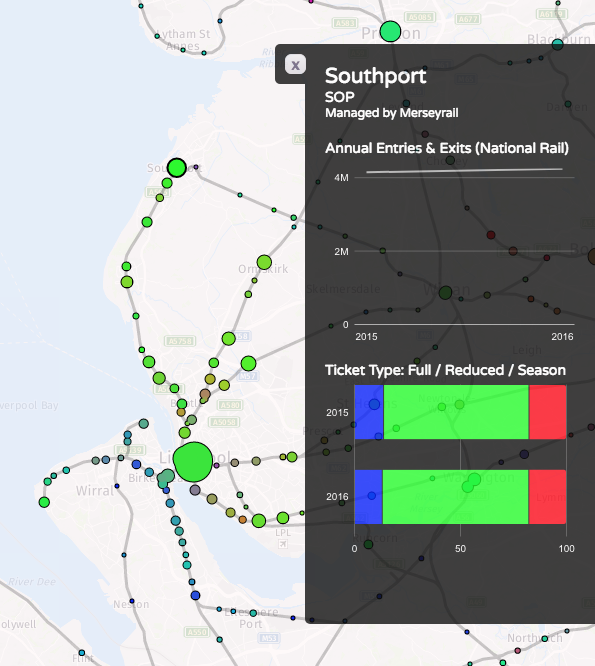 The data is split by ticket type – full fare, reduced fare (off-peak tickets, tickets bought with railcards, advance tickets, child tickets etc) and season tickets. They make this data available as an Excel spreadsheet, so I’ve crunched it and have produced a couple of maps based on this data. I have also consolidated the total counts and ticket type counts data on CDRC Data. 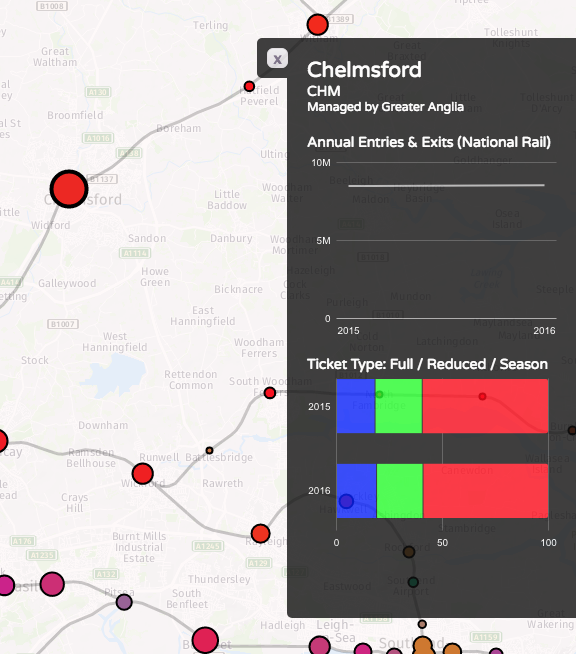 The first shows the total numbers of entries/exits across the last year that the data is available for (2016-7), with a blended colour, with different red/green/blue strengths proportional to the % numbers for season tickets (red), full fare (blue) and reduced fare (green) entering/exiting National Rail services at that station. The area of the circle is proportional to the total numbers, combined across the ticket types. 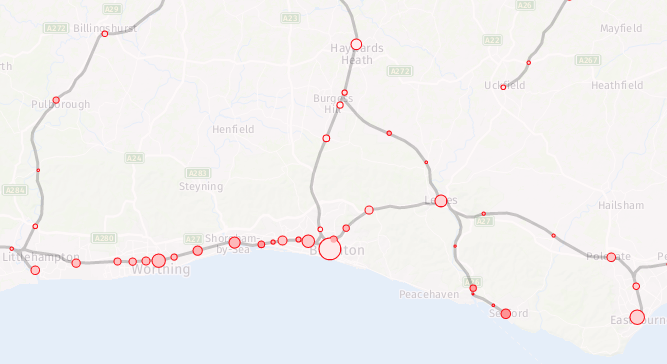 I’m using a minimum circle size, as otherwise some stations would be practically invisible on the map, as they can see days go by without any passengers – or trains. See this map on TubeCreature. There is also a big drop at Kensington Olympia’s however the source reports says this is due to a methodological change – i.e. it may not have actually been a significant drop at all. This is somewhat puzzling, as there are ticket gates at this station, so in/out numbers should be pretty solid, but it may be relating to due to many fewer people, than previously thought, transferring in-barrier to the sparse District line services at this station. When they do this, they are no longer considered to be National Rail passengers and so have “exited” the station here, from a National Rail perspective. See this map on TubeCreature. You can also download all the total counts and ticket type counts data from CDRC Data. As part of a presentation I gave yesterday at the RSAI-BIS (Regional Science Association International – British & Irish Section) annual conference, on DataShine Travel to Work maps, I outlined the following eight techniques to avoid swamping origin/destination (aka flow) maps with masses of data, typically shown as straight lines between each pair of locations. Lines tend to obscure other lines, making the flows of interest and significance harder to spot, and creating an ugly visual impact. 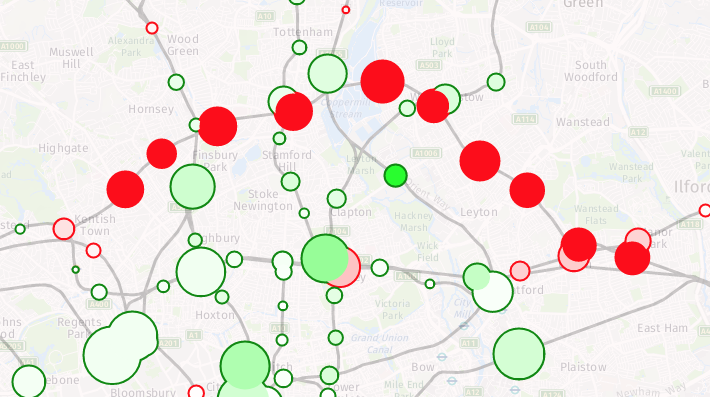 See above for an extreme example which shows (all) cycle-to-work flows in inner-city London. Large numbers of flow lines, if delivered as vectors to a web browser, can also cause the web browser to run slowly or run out of memory, affecting the user experience. To avoid this, I generally try to use one or several of the following techniques. 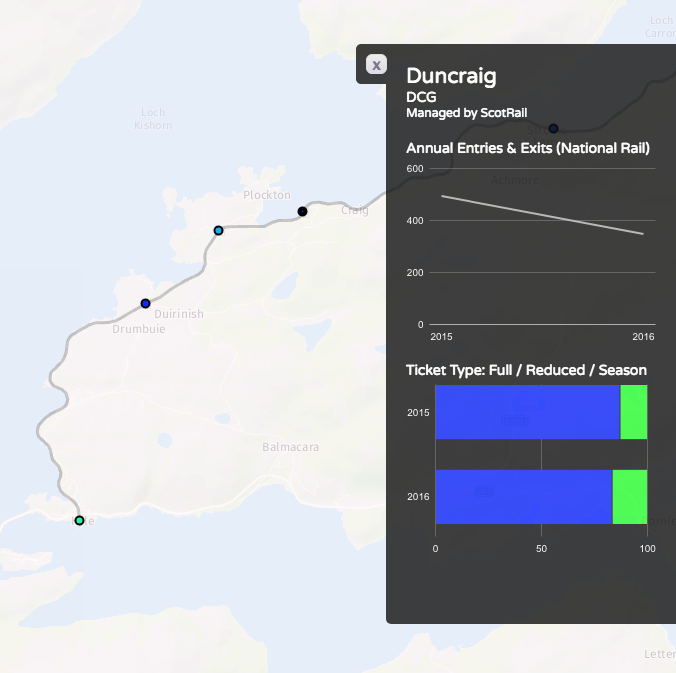 From L to R, DataShine Commute, Understanding Scotland’s Places (USP) and DataShine Region Commute, the last one showing that, in some cases, this can still produce an overload of lines. 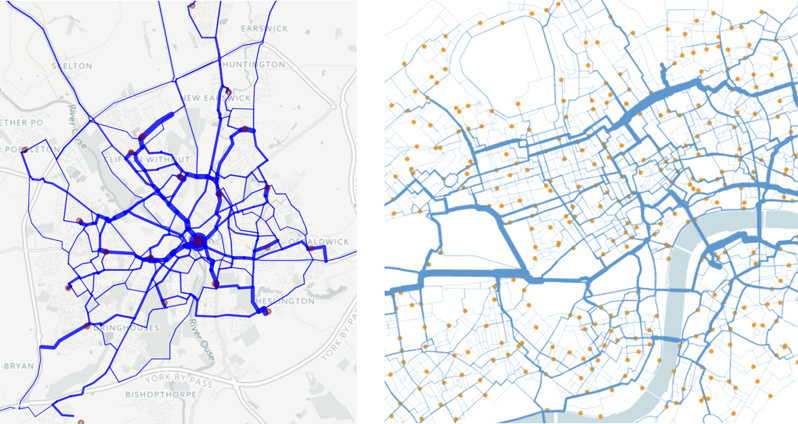 From L to R, The Great British Bike To Work (with a simple flow-size threshold) and Understanding Scotland’s Places, which uses a dynamic origin-based theshold, shown here with the constrasting number of bidirectional flows visualised from a large city (centre) with those from a small town (right), each being selected in turn. 3. Minimise the overall number of possible origins/destinations. What you lose in detail you might gain in clarity and simplicity. DataShine Region Commute only shows flows between LAs, rather than the spatial detail of flows within them. 4. Restrict the geography. The Propensity to Cycle Tool (Lovelace R et al, 2017) shows the main flows (based on a threshold) on a county-by-county basis, with easy and clear prompts to allow the user to move to a neighbouring county if they wish. 5. Bend the lines. Tools, such as the Stanford Flow Map Layout tool or Gephi with the “Geo Layout” and curved lines, allow flow lines to be clustered or curved in a way that reduces clutter, while retaining geography. The first approach clumps pairs of flow lines together in a logical way, as soon as they approach each other. The second approach simply curves all the lines, on a clockwise basis, generally removing them from the central area unless that is their destination. See also this paper by Bernhard Jenny (Jenny B. et al, 2017) which details the benefits of curving lines and further cartographic modifications, and this paper by Stefan Hennemann (Hennemann S. et al, 2015) which outlines a sophisticated approach to grouping together flow lines, on a world-wide basis. 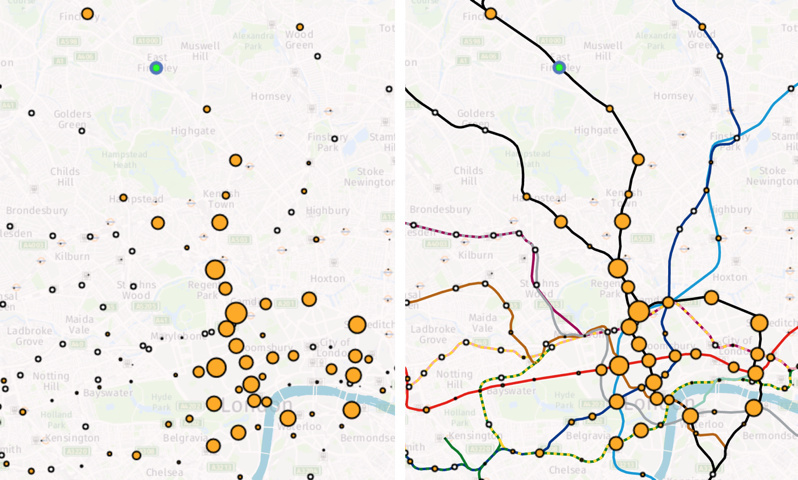 From L to R: Commutes into London from districts outside London, from the 2001 census, by Alastair Rae (Rae A., 2010) using the Stanford Flow Map Layout tool, and top destination for each origin tube station, based on Oyster card data, by Ed Manley (Manley E., 2014) using a particular Gephi flow layout. 6. Route the flow. Snap the lines to roads or other appropriate linear infrastructure, using shortest-path or sensible-path routing, and combining the segments of lines that meet together, either by increasing the width or adjusting the hue or translucency. 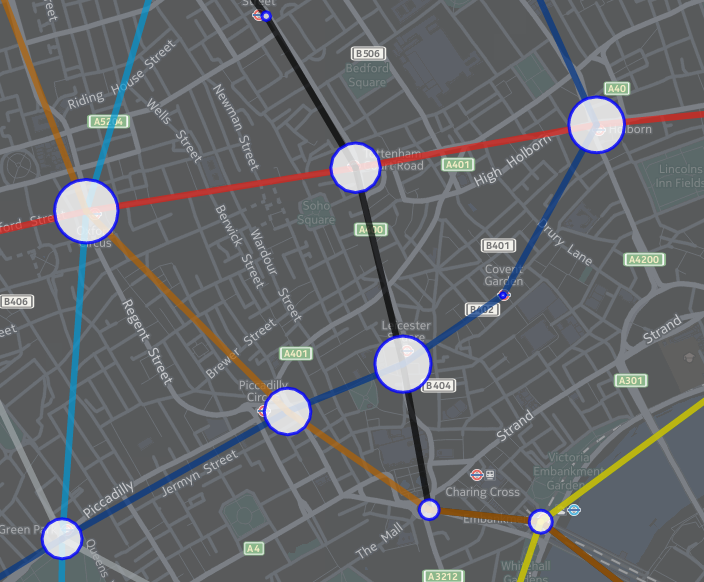 From L to R: The Propensity to Cycle Tool (Lovelace R et al, 2017) routed for shortest path, and journeys on the “Boris Bikes” bikeshare system in central London, routed with OSM data to the shortest cycle-friendly route. In both cases, journeys meeting along a segment cause the segment to widen proportionally. 7. Don’t use a simple geographical map. 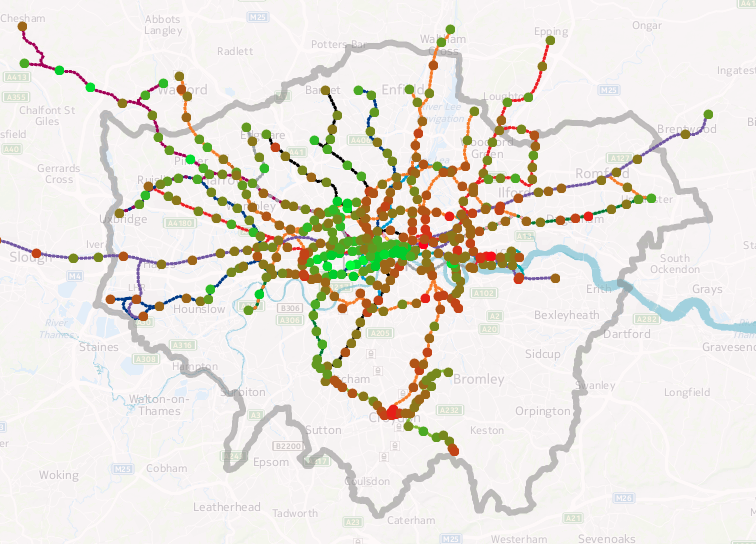 This map, created by Robert Radburn at City University (Radburn R, 2015) in Tableau, is a “small multiple” style map of car commutes between London boroughs, with a map of London being made up itself of miniature maps of London. Each inner map shows journeys originating from the highlighted borough to the other boroughs. These maps are then arranged in a map themselves. It takes a little getting used to but is an effective way to show all the flows at once, without any potentially overlapping lines. 8. Miss out the flow lines altogether. Here, a selected origin (in green) causes the destination circles to change in size and colour, depending on the flow to them. 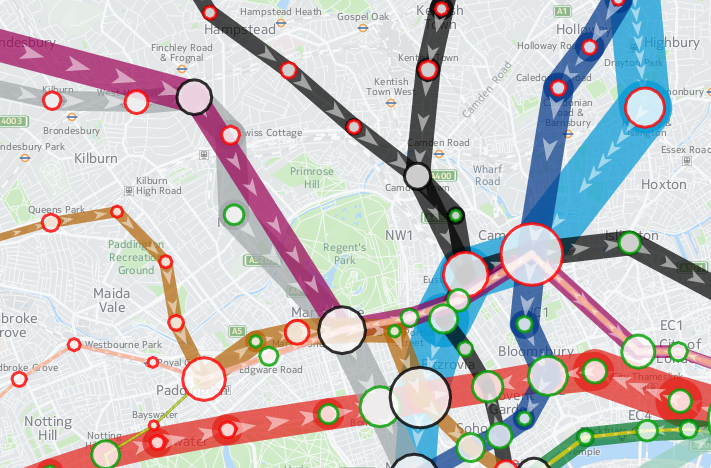 In this case, the flow is modelled commutes on the London Underground network – made clearer by the addition of the tube lines themselves on the second map – but just as a background augmentation rather than flow lines. My latest London data visualisation crunches an interesting dataset from the Department of Transport (there’s also a London Borough of Southwark version using their local observation data). 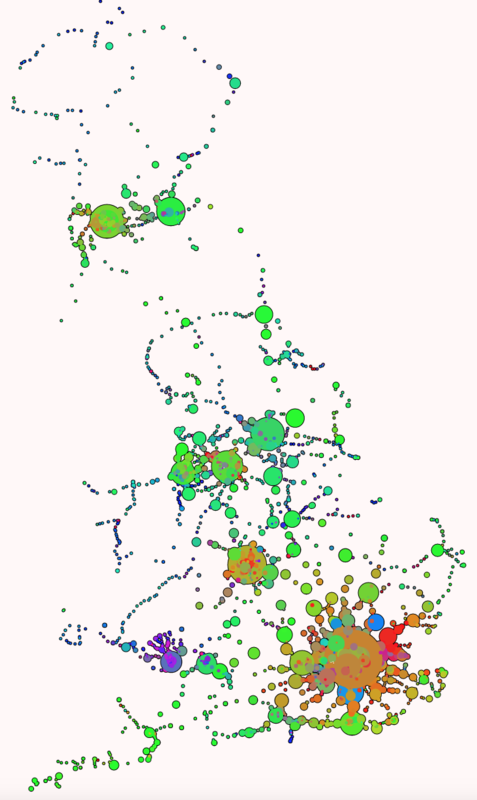 The data is available across England, although I’ve chosen London in particular because of its more interesting (i.e. not just car dominated) traffic mix. I’ve also focused on just the data for 8am to 9am, to examine the height of the morning rush hour, when the roads are most heavily used. 15 years worth of data is included – although many recording stations don’t have data for each of those years. You can choose up to three modes of transport at once, with the three showing as three circles of different colours (red, yellow and blue) superimposed on each other. The size of each circle is proportional to the flow. It’s not strictly a new visualisation, rather, it’s an updated version of an older one which had data from just one year, using “smoothed” counts. But it turns out that the raw counts, while by their nature more “noisy”, cover a great many more years and are split by hours of the day. I’ve also filtered out counting stations which haven’t had measurements made in the last few years. 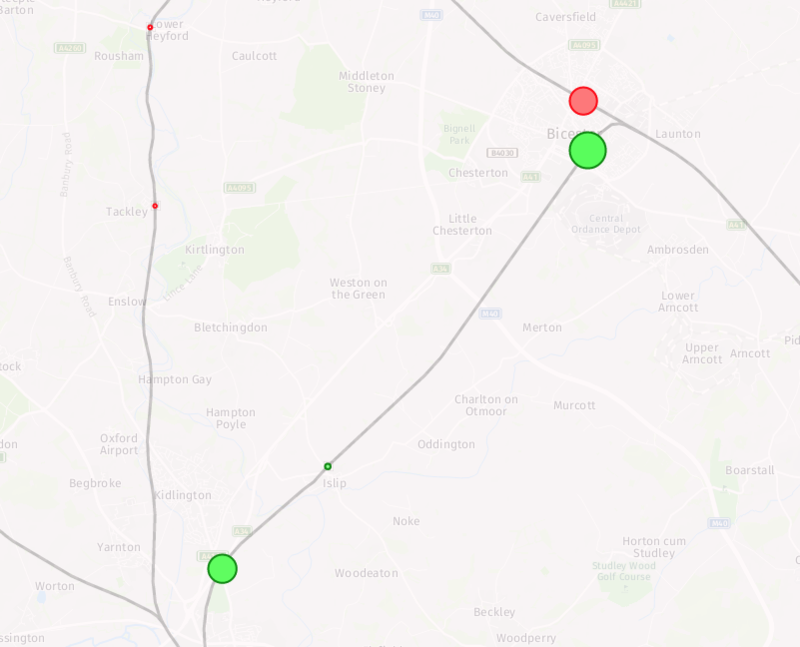 Note also the graph colours and map colours don’t line up – unfortunately the Google Material API, that I am using for the charting, does not yet allow changing of colours. I’ve produced an updated version of a graphic that my colleague Dr James Cheshire created a few years ago, showing how the estimated life expectancy at birth varies throughout the capital, using a geographical tube map to illustrate sometimes dramatic change in a short distance. 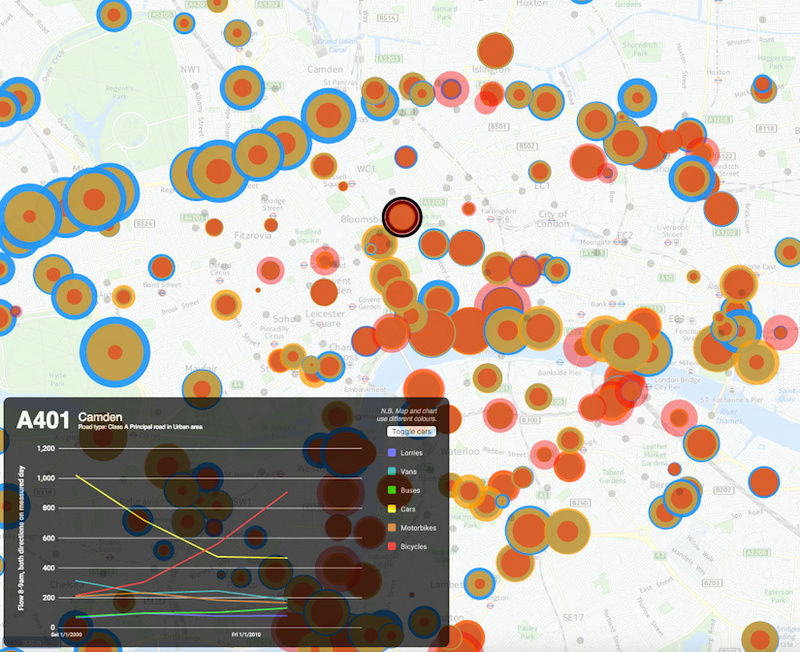 You can see an interactive version on my tube data visualisation platform. Click a line colour in the key on the bottom right, to show just that line. For example, here’s the Central line in west London. The data source is this ONS report from 2015 which reports averages by MSOA (typical population 8000) for 2009-2013. I’ve averaged the male and female estimates, and included all MSOAs which touch or are within a 200m radius buffer surrounding the centroid of each tube, DLR and London Overground station and London Tram stops. I’ve also included Crossrail which opens fully in 2019. The technique is similar to James’s, he wrote up how he did it in this blogpost. 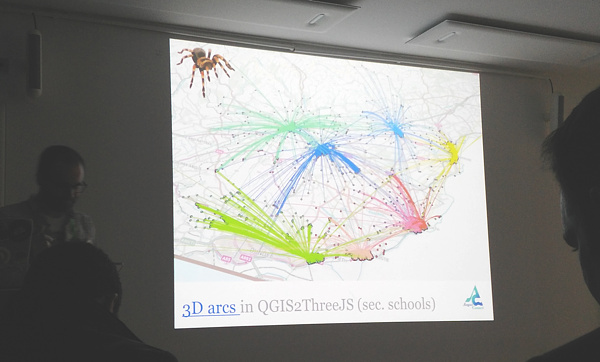 I used QGIS to perform the spatial analysis. The file with my calculated numbers by station is here and I’m planning on placing the updated code on GitHub soon. My version uses different aggregation units (MSOAs) to James’s original (which used wards). 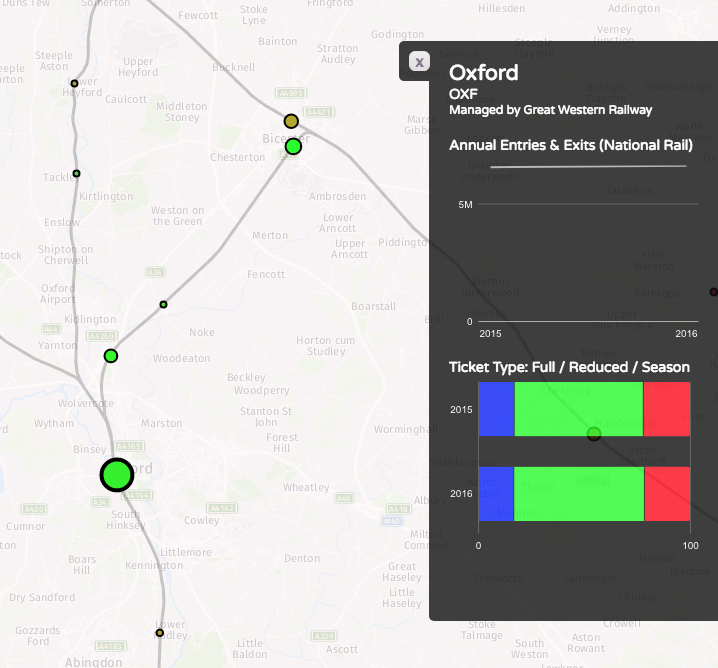 As such, due to differing wards and MSOAs being included within each station’s buffer area, you cannot directly compare the numbers between the two graphics. 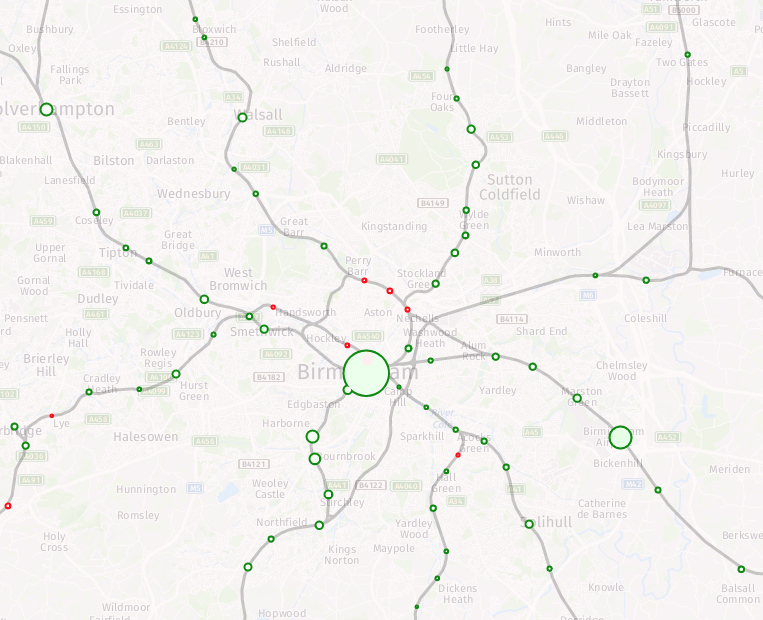 An addition is that I can include stations beyond the London boundary, as James’s original dataset was a special dataset covering the GLA area only, while my dataset covers the whole of England. The advantage of utilising my data-driven platform means that I can easily update the numbers, as and when new estimates are published by the ONS. 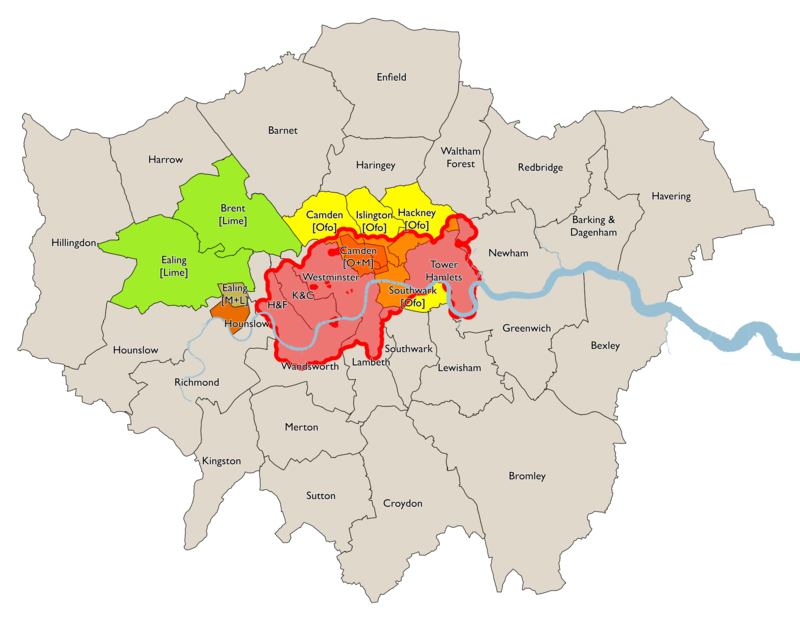 Estimating life expectancies at birth for small areas, such as MSOAs, is a tricky business and highly susceptible to change, particularly due London’s high rates of internal migration and environmental change. Nevertheless it provides a good snapshot of a divided city. Data: ONS. Code: Oliver O’Brien. Background mapping: HERE Maps. 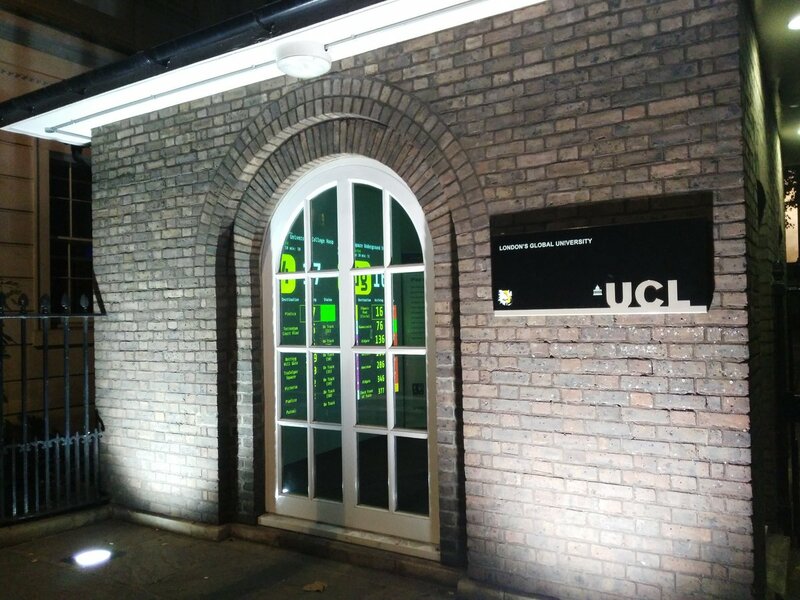 The Consumer Data Research Centre (CDRC) at UCL is organising a short pop-up exhibition on hyperlocal data: Big Data Here. The exhibition is taking place in North Lodge, the small building right beside UCL’s main entrance. The exhibition materials are supplied by the Centre for Advanced Spatial Analysis (CASA). Inside, a big projection shows local digital information. What the screen shows will change daily between now and Friday, when the exhibition closes. Today it is showing a live to-the-second feed of bus arrivals at the bus stop outside the North Lodge, and tube train arrivals at Euston Square station just up the road. Watch the buses zip by as they flash up “Due” in big letters on the feed. 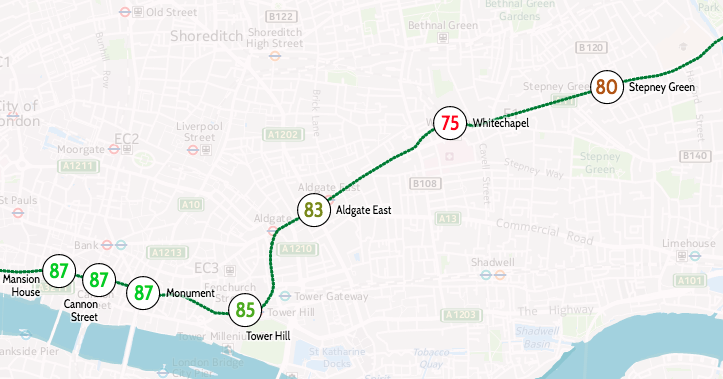 Both of these are powered by Transport for London’s Unified Push API, and we are planning on publishing the visualisation online next week. Tomorrow will be showing a different local data feed, and then a final one on Friday. Opposite the projection is the iPad Wall. This was created by CASA a few years back by mounting a bank of iPads to a solid panel (above photo shows them in test mode) and allowing remote configuration and display. The wall has been adapted to show a number of metrics across its 12 panels. Four of these showcase footfall data collected by one of our data partners, and being used currently in CDRC Ph.D. research. The other panels show a mixture of air quality/pollutant measures, tube train numbers and trends, and traffic camera videos. 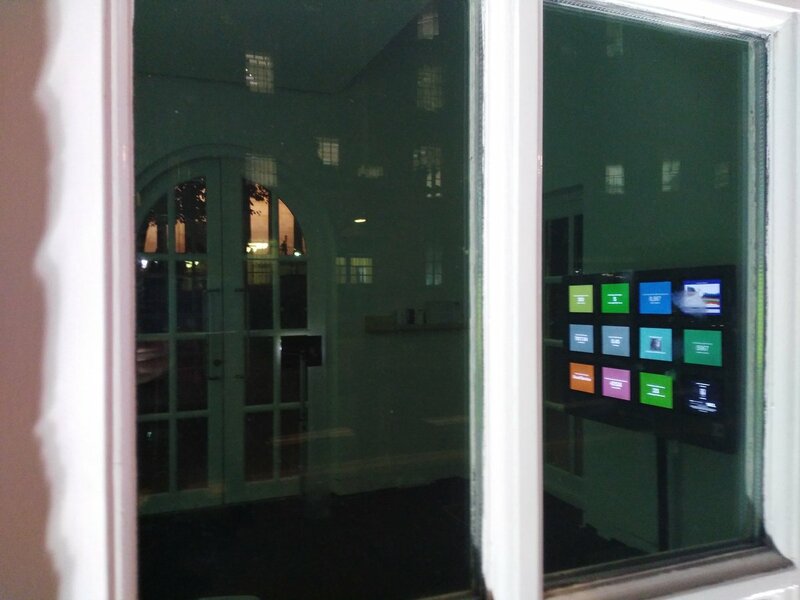 We hope that passersby will enjoy the exhibition visuals and use them to connect the real world with the digital space, a transposition of a digital data view onto the physical street space outside. Big Data Here is taking place during Big Data Week 2016. Visit the exhibition website or just pop by UCL before Friday evening. Like its English counterpart IMD, SIMD is released every few years by the Scottish government, as a dataset which scores and ranks every small statistical area in Scotland according to a number of measures. These are then combined to form an overall rank and measure of deprivation for the area. This can then be mapped to show the geographical variation and spread of deprived (and non-deprived) communities across the country. 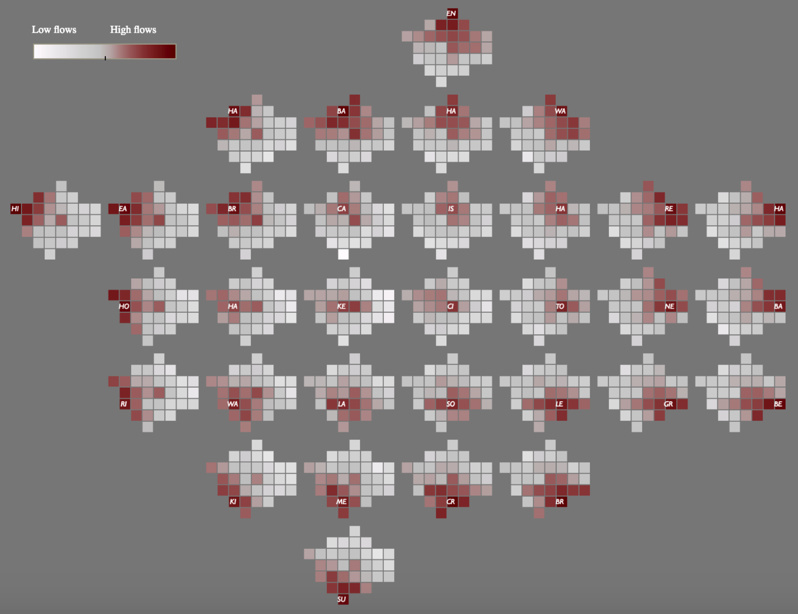 I mapped SIMD 2012 for The New Booth Map and also it appears as a layer in CDRC Maps. 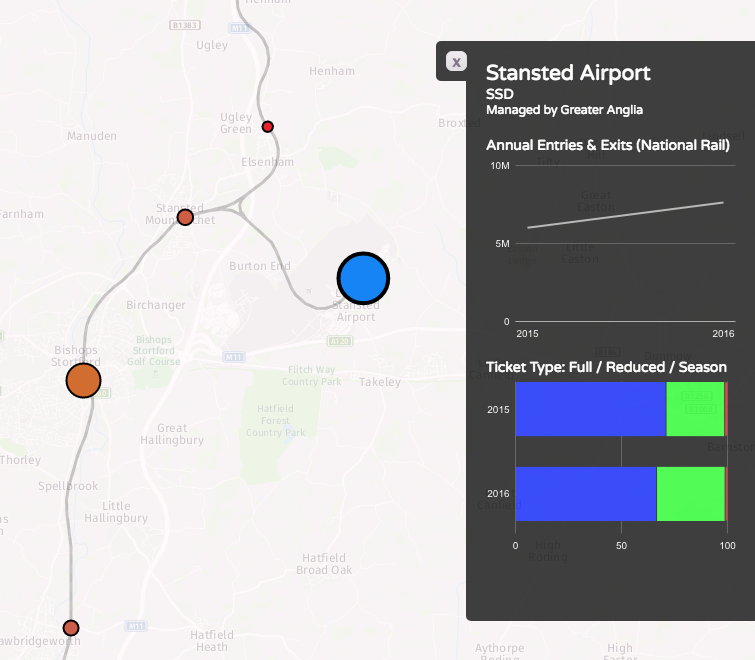 Dr Cheshire and I recently were commissioned to produce a new website to showcase the older SIMD 2012, and for the release of SIMD 2016, that contained tools useful for researchers and other specialist users, such as specific area data selection and retrieval and map downloads. 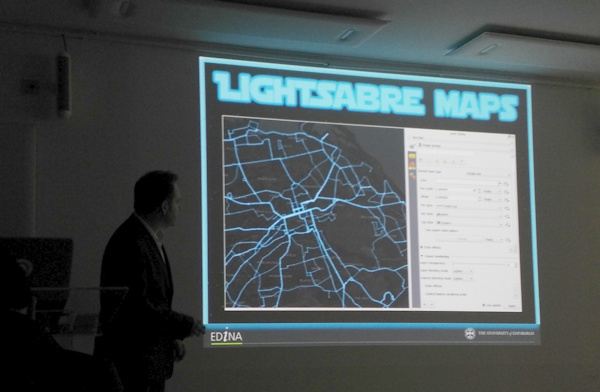 The base of the website was the “DataShine” mapping style used in both the above examples, where only buildings are coloured, so that urban areas can be easily seen and related. With the great majority of the Scottish population in urban areas, and vast areas of unpopulated land in the country, this style of mapping is very useful both to draw the eye to where the population is, and also present a map that is a more familiar representation of the country. As such, even though this is intended to be a “pro users” site, it is accessible and useful to the general viewer too. The new website SIMD.scot, was launched by the Scottish Government along with the SIMD 2016 statistical release, at the end of August. It was featured on the BBC News Scotland website, as well as on the Daily Record and Scotsman newspaper websites, drawing 60,000+ visits in the first few days. UTFGrids, at 4×4 pixel resolution are used for the mouseover popup data on component indices. I use HTML5 Download to create a PNG image of the current map view – this works only in Chrome and Firefox. A “mobile” version of the website starts with an area chooser dialog, when viewed on screens smaller than 800px wide. 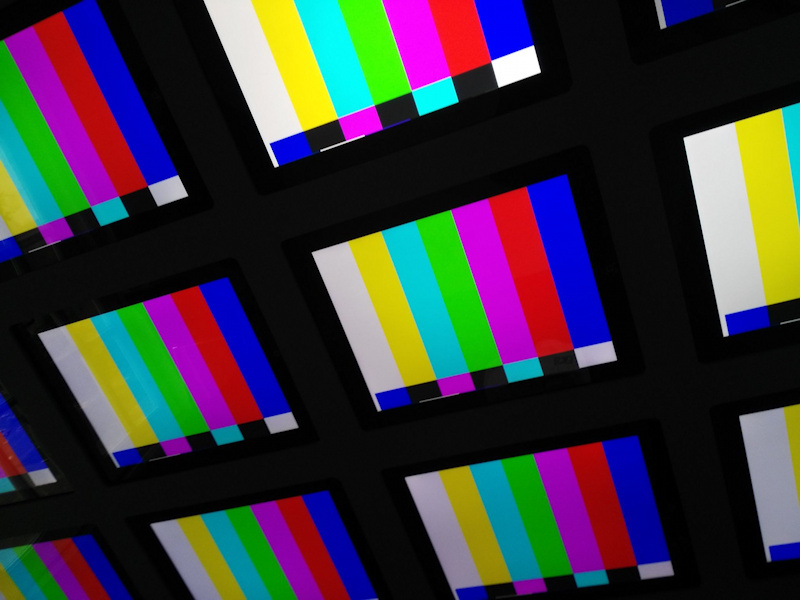 The website uses static content (except for the postcode search) in order to load quickly, even when many people are viewing the site at once. The work was carried out through UCL Consultants. 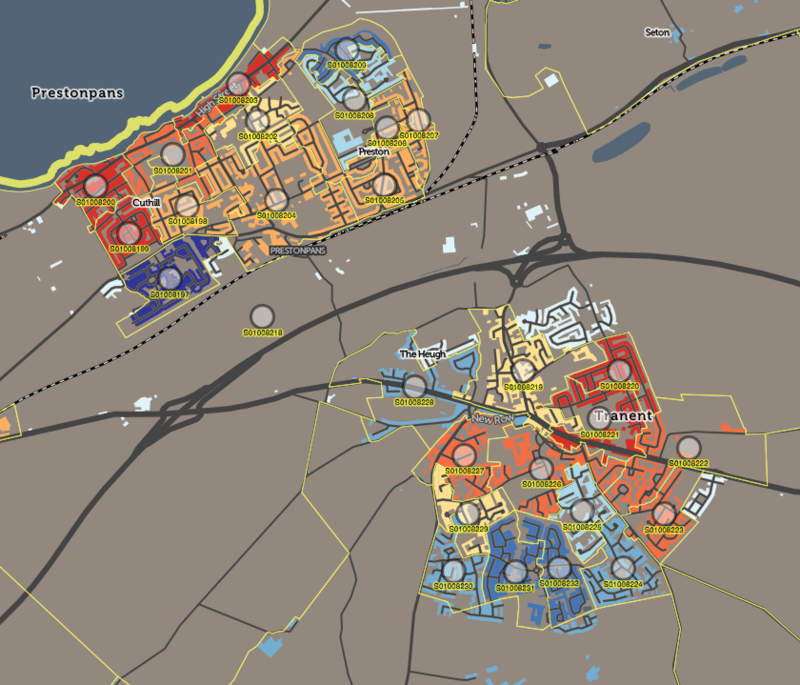 Explore the SIMD 2016 map itself at SIMD.scot or see the 2012 version. 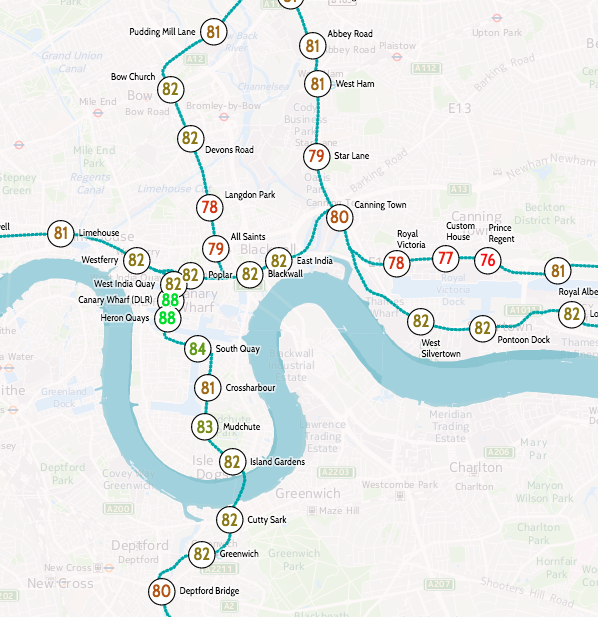 The data includes, in fifteen-minute intervals throughout a weekday, the volume of tube passengers moving between every adjacent pair of stations on the entire tube network – 762 links across the 11 lines. It also includes numbers entering, exiting and transferring within each of the 268* tube stations, again at a 15 minute interval from 5am in the morning, right through to 2am. It has an origin/destination matrix too, again at fine-grained time intervals. 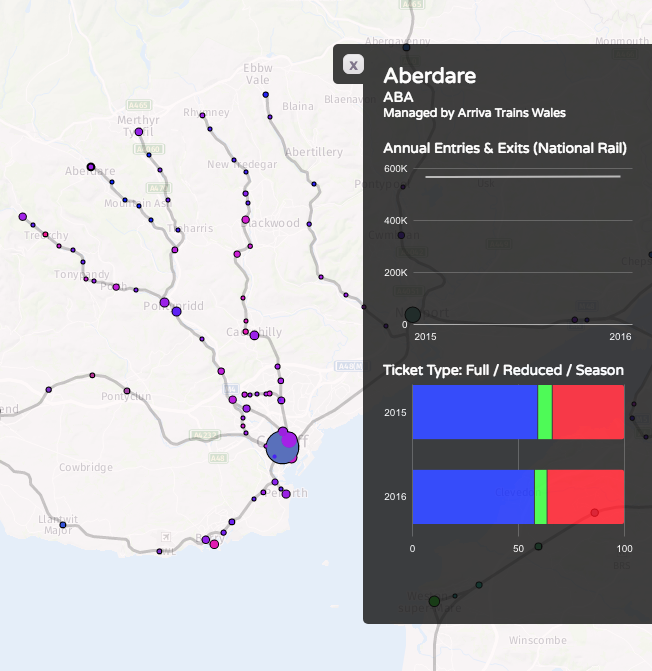 The data is modelled, based on samples of how and where passengers are travelling, during a specimen week in the autumn – a period not affected either by summer holidays or Christmas shopping. The size of the sample, and the careful processing applied, means that we can be confident that the data is an accurate representation of how the system is used. The data is published every few years – as well as the most recent dataset, I have included an older one from 2012, to allow for an easy comparison. Check the later panels in the Story Map, the intro which appears when first viewing Tube Heartbeat, for more examples of local quirks. There is some further information about the project on the HERE 360 blog, and I am looking to publish a more deatiled blogpost soon about some of the technical aspects of putting together Tube Heartbeat. Try out Tube Heartbeat now. See more information on HERE 360. * Bank/Monument treated as one station, as are the two Paddington stations. ** Other stations have higher flows at this time but as a decline from previous peak. I’m hoping to also, as time permits, extend Tube Heartbeat to other cities which make similar datasets available. At the time of writing, I have found no other city urban transport authority that publishes data quite as detailed as London does, but San Francisco’s BART system is publishes origin/destination data on an hourly basis, there is turnstyle entry/exit data from New York’s MET subway, although only at a four-hour granularity, and Washington DC’s metro also publishes a range of usage data. I’ve not found an equivalent dataset elsewhere in Europe, or in Asia, if you know of one please do let me know below. The data represented in Tube Heartbeat is Crown copyright & database right, Transport for London 2016. Background mapping imagery is copyright HERE. There was a time when Google Maps was an ugly ducking. It started life as a road map, and its grey background was decryed at a memorable keynote at the British Cartographic Society annual conference 8 years, contrasting with the classic Ordnance Survey Landranger maps where the spaces between roads were normally full of “something” – be it contours, trees or antiquities. 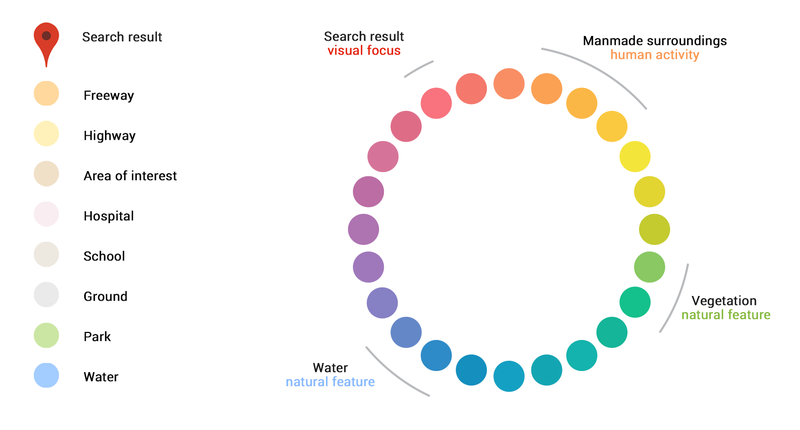 Google’s features, on the other hand, were pretty messy, and often wrong. 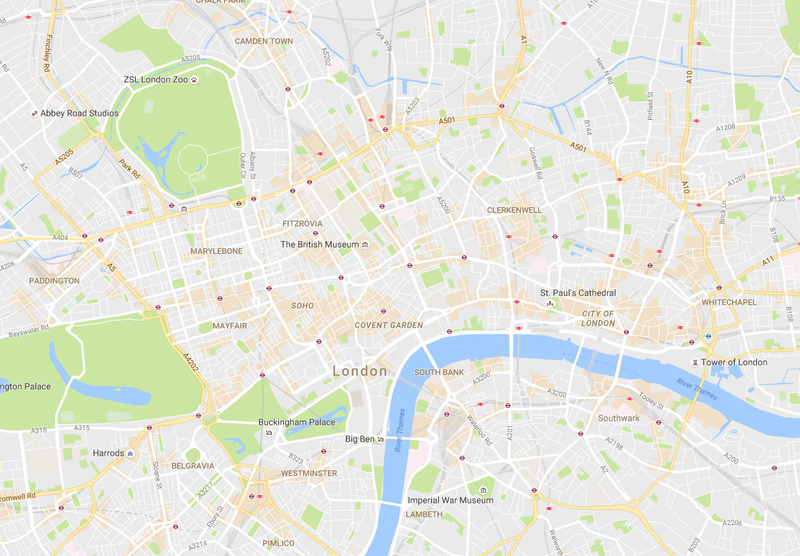 However, Google has been steadily beautifying its functional map (and correcting it), focusing on the cartography as well as the data, as it turns from a map of roads and POI pins, to a map of everything. 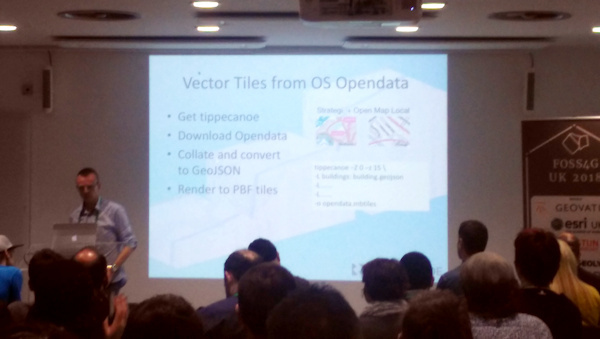 2013 was a big step forward, when the map became vector-based and superimposed features customised to just you. Now in 2016, it’s the look of the map itself that is the focus. 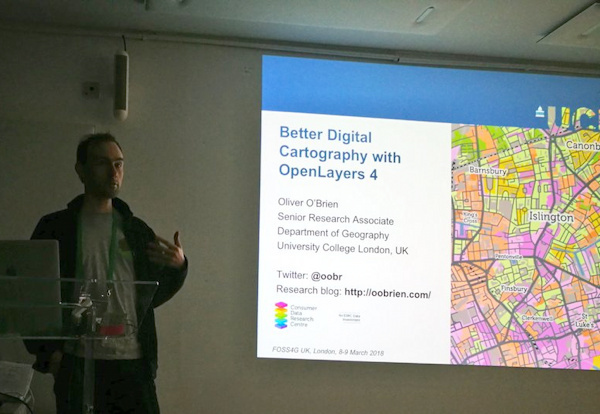 Cartography on digital maps is far from dead. There is a clear use of complementary colours to balance out the map – the search results and current user interest shown in red, man-made features in pinks and oranges, and natural features in greens and blues, all criss-crossed with the white (and yellow) transport networks. It makes for a map that is logical to look at – and crucially, one that is immediately pleasing to the eye. It doesn’t “shout” at you any more. 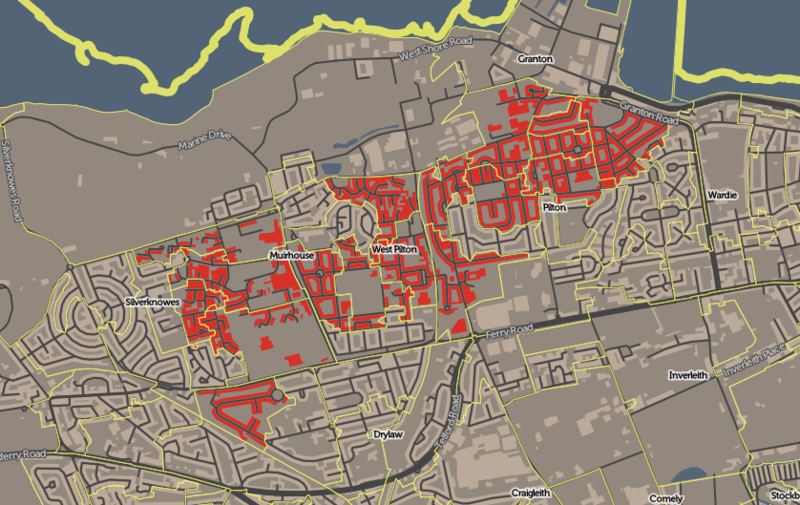 One final note – the “Areas of Interest” is a powerful new bit of cartography – it draws the eye to it, and means Google Maps has a significant influence on what parts of an unfamiliar city you are likely to visit. It’s a subtle but key bit of “suggestive” mapping. Bad news for the businesses though that rely on passing trade, and are not in these areas. A startup with a billion dollar asset. This is how HERE’s new CEO Edzard Overbeek describes the location services company that is making a striking pitch for being the third major digital mapping and location platform alongside Google and Apple. HERE has had an interesting recent history. Originally NAVTEQ, one of the major cross-world road network databases, used by various “sat nav” systems, it was bought by Nokia and became Nokia Maps, before being rebranded as Ovi Maps. Nokia then sold its phone business to Microsoft – but as the latter already had Bing Maps, the digital mapping business was spun off into a new unit and sold to a consortium of German car companies. At the time, this perhaps seemed a surprising new set of owners but it has quite quickly become obvious – with self-driving car technology suddenly seemingly closer on the horizon, the need to have a global, highly precise digital map of the world’s streets is suddenly incredibly important – the aforementioned billion dollar asset. 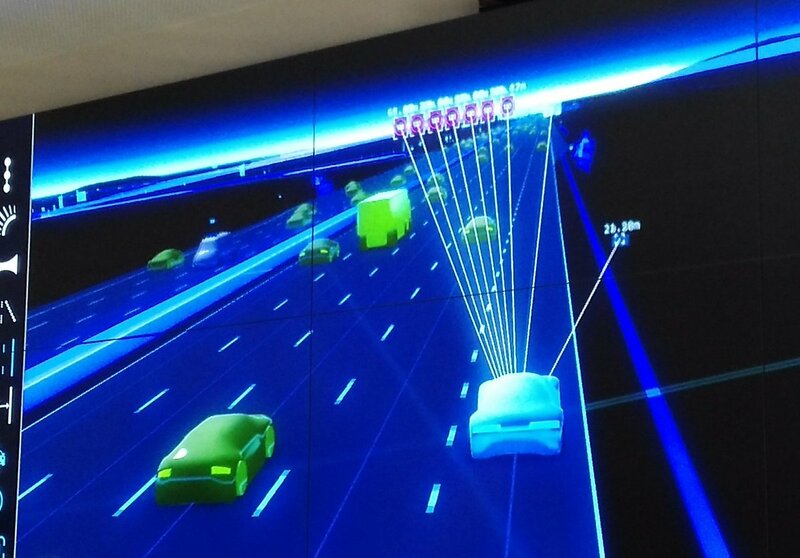 Google has been building it up from its initial, low-precision mapping, using its fleet of LIDAR mapping cars, and Apple has been doing the same, arguably starting from an even worse base. HERE has arrived in the space with the highest quality start, having been based on a digital map that is over 20 years old. 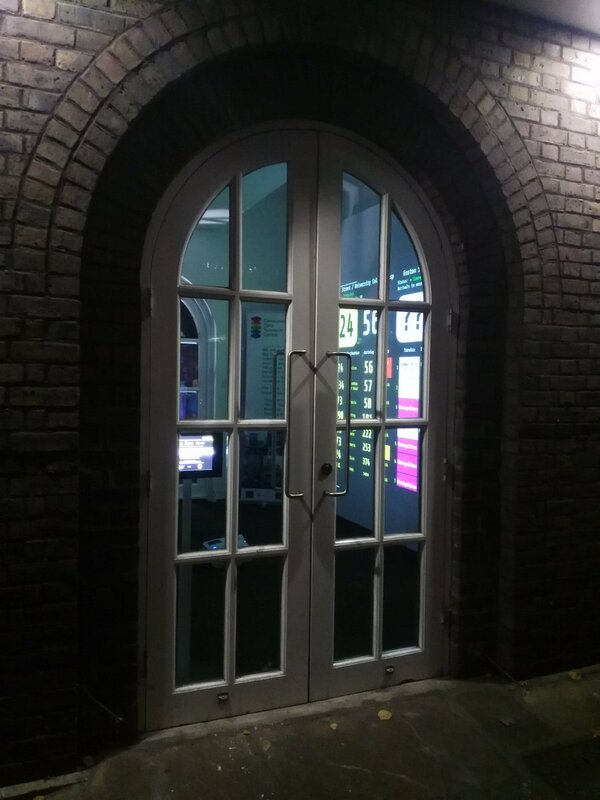 HERE was kind enough to invite me to an event, insideHERE, at their European headquarters in the heart of Berlin, for demonstrations of their portfolio, using some of the platforms used recently at MWC, CES and the other major trade exhibitions in the technology and mobile space. They also discussed a few “under the hood” features, and what they are working on right now. 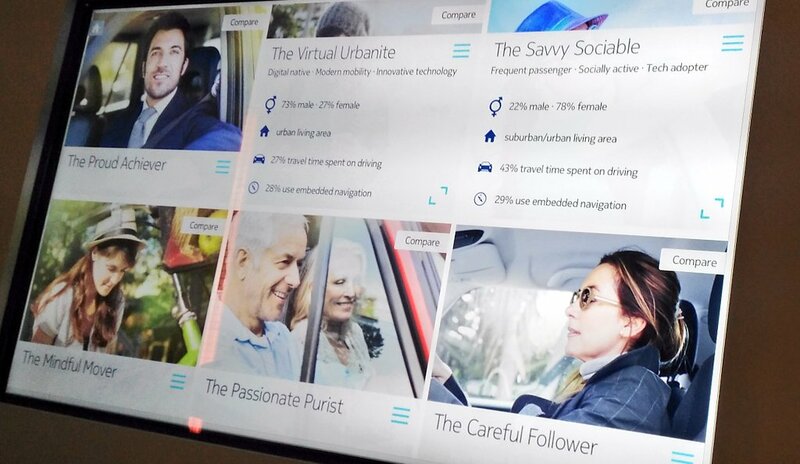 There were three themes, reflecting the three main segments of digital mapping at the moment – business, consumer and auto. A cancelled flight at very short notice (thanks for nothing, Norwegian!) meant that I arrived in Berlin late and so missed the first two. The first can be summarised with the HERE Reality Lens Lens product which provides high quality asset and street furniture mapping for the use and management by local authorities, and the second is encompassed by the HERE mobile app digital app, which occupies the same space as Apple Maps and Google Maps app, aiming to displace these on their respective platforms. This is a challenge of course, as the existing apps are pretty good, so HERE’s unique selling point is that they are designed for offline from the ground up (Google Maps offers this on a slightly more restricted basis, but HERE will be available in offline mode for an area, as soon as you initially load it up online.) Reality Lens and the HERE Offline Maps app are nice pieces of technology that utilise data from HERE’s car data gathering options and make it accessible to public sector and consumer users respectively, but it was clear, both from HERE’s new owners and the comparative length of time used during the day, that HERE Auto is the key sector for the company now. 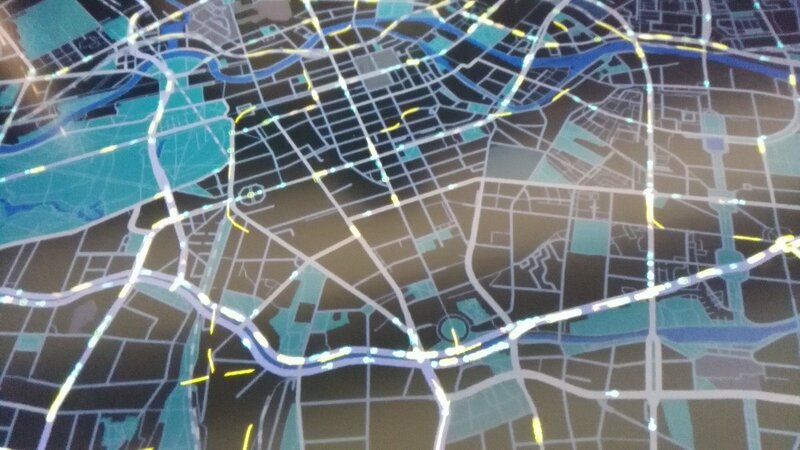 The other maps shown were in the user interface (i.e. 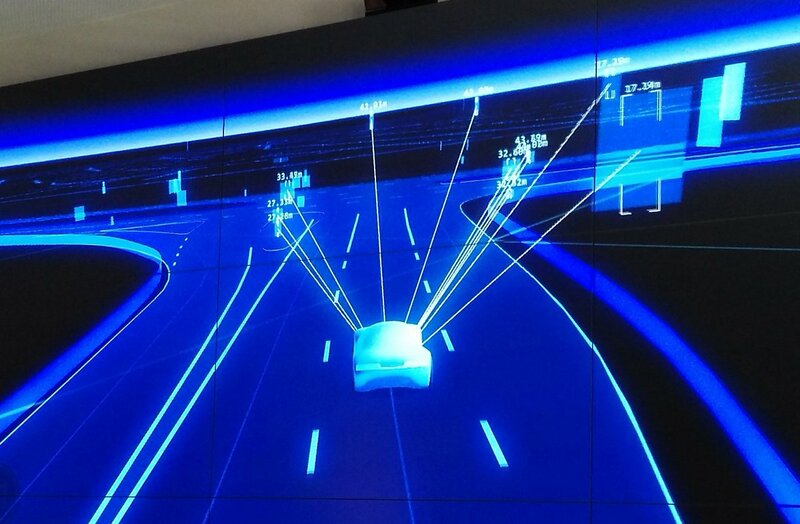 dashboard/HUD) of a car test-rig, which is being used for UX/UI testing of autonomous/mixed-mode driving. I wrote about this in this previous blogpost. Perhaps the most “exclusive” part of the day’s event was an hour long “fireside” chat with the new CEO of the company. As a relatively small group (there were around 10 of us)l, this was an excellent opportunity to grill the top-guy of one of the world’s three from-technology digital mapping providers (as opposed to from-GIS like ESRI or from-paper like the OS). Edzard Overbeek answered every question we threw at him efficiently. I quizzed him on whether indoor digital mapping, the “next frontier” identified by Google at least, will also be a priority for HERE given its new driving focus, to which Mr Overbeek was clear that, in order to be a serious player in the space it needs to be mapping everything, so that a single platform is available cross-use, i.e. if a customer journey ends with a walk through a department store, the platform needs to do the “last 100m” mapping too. It’s clear also that the HERE offline maps app will remain a key part of the company’s offering – not just to realise the value of their existing, long-built-up “consumer-grade” mapping, but to build the “HERE” brand to consumers. 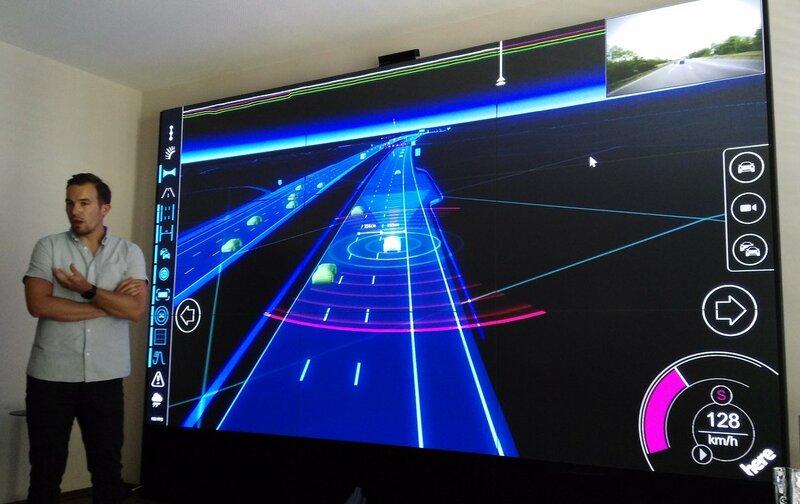 Ultimately though, their most important clients are the car companies – both the three that own the company but also others needing a “car mapping operating system”.